AUTO DEALERSHIP ADS « THE BRYCE IS RIGHT! « WHERE DID ANTIFA COME FROM? – Do they really have to be so bad? I’ve seen a lot of bad advertisements in my day, everything from ads on television, to radio, to billboards, to print media and the Internet, but I would have to say that local automotive dealers have been consistently the worst I’ve seen. I think “obnoxious” is perhaps the best adjective to describe local car ads and maybe they have to be as it is a highly competitive market. I think they try to put their best foot forward but inevitably they end up becoming overbearing and look like classless bumpkins. I used to think California had the most obnoxious car dealers in the country, but I believe just about every one else has caught up with them. On television you commonly see loudmouthed sales managers, or you have the dealership owner who is usually a “Jolly Wally” type who means well but has no business being in front of a camera. Local sports figures are commonly used by dealerships, but I think it’s only so the dealer can get his autograph. Most dealers use some sort of gimmick and catch phrase for the public to associate with their dealership. This is probably not a bad idea, but most are pretty cheesy expressions which makes most people groan. These catch phrases are then splattered everywhere on television, radio, newspapers, the dealer’s web page, and on auto decals and license plates. This last item particularly bugs me; You buy a new car from the dealer and after it is prepped to take home you find it has become a rolling billboard for the dealer with his name and slogan neatly labeled on your car and with his license tag frame. I always admired the audacity of the dealers for putting their crap on our cars. Remarkably, few people ask for it to be removed or to be paid for advertising the dealer’s company. Flags are often used to draw attention to car dealerships, particularly down here in the South. Quite often you’ll find huge American flags waving overhead to appeal to your sense of patriotism when you buy a car. I find this particularly amusing for dealerships featuring foreign cars, like Japanese, German, or Korean. Come on, who is kidding who here? Then of course there are the key chains, shirts, and other trinkets that bear the dealer’s name and slogan. I find it interesting when they want us to pay for such items as opposed to paying us to advertise their firm. Auto dealerships rarely offer first class advertisements. Most simply can’t afford it and slap together some loud ad which would make just about any Madison Avenue ad exec cringe. 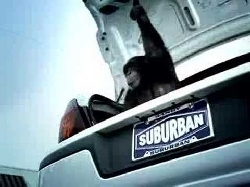 The one exception seems to be Oregon’s Suburban Auto Group with their legendary “Trunk Monkey” series of commercials. Whereas other dealerships aren’t taken seriously because of their ads, Suburban tries to lighten things up and in the process has garnered nationwide recognition. The point is, auto dealership ads really don’t have to be as bad as they are. NEXT UP: THE SFB QUOTIENT – A test to measure yourself. LAST TIME: TWO TYPES OF LEADERS – Which one do you work for? This entry was posted on September 1, 2017 at 8:00 am	and is filed under Automotive, Media. Tagged: AUTO DEALERSHIP ADS, Florida, palm harbor, The Bryce is Right, tim bryce. You can follow any responses to this entry through the RSS 2.0 feed. You can leave a response, or trackback from your own site.